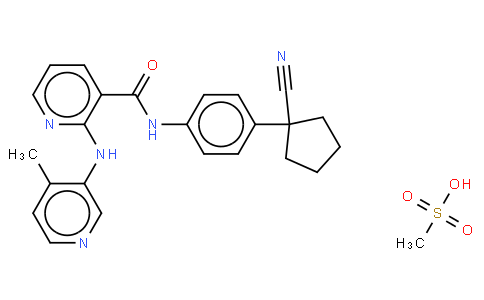 Apatinib is an orally bioavailable, selective VEGFR2 inhibitor with IC50 of 1 nM. Apatinib (YN968D1) is a novel, orally bioavailable, selective inhibitor with potential antiangiogenic and antineoplastic activities. Apatinib selectively binds to and inhibits VEGFR2. Apatinib can also potently suppress the activities of Ret, c-kit and c-src with IC50 of 0.013 M, 0.429 M and 0.53 M, respectively. Apatinib inhibits cellular phosphorylation of VEGFR-2, c-kit and PDGFR. Apatinib significantly inhibits proliferation stimulated by 20 ng/mL VEGF (IC50 = 0.17M). Apatinib effectively inhibits proliferation, migration and tube formation of human umbilical vein endothelial cells induced by FBS, and blocked the budding of rat aortic ring. Apatinib reverses ABCB1- and ABCG2-mediated MDR by inhibiting their transport function, but not by blocking the AKT or ERK1/2 pathway or downregulating ABCB1 or ABCG2 expression. Apatinib significantly potentiates the cytotoxicity of established ABCB1 and ABCG2 substrates and increased the accumulation of DOX and Rho 123 in ABCB1- or ABCG2-overexpressing cells. Furthermore, apatinib significantly inhibited the photoaffinity labeling of both ABCB1 and ABCG2 with [125I]iodoarylazidoprazosin in a concentration-dependent manner.